If you're planning a dish with a sauce, prepare it ahead of time. If you're using a protein like tofu, you'll want to drain it of any liquid (use the firmest tofu you can find), and may want to consider baking it to further dry it out. Crumbly tofu can become a mushy mess if it's stir fried too long. 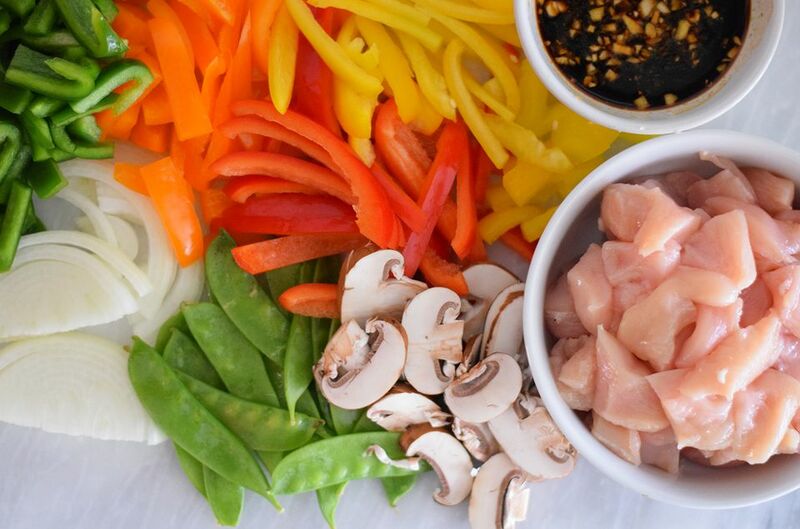 Make sure you have all your vegetables and other ingredients chopped and ready to go before you start your stir-fry. This method of cooking is very quick, so you won’t have time to do much other than stir once you start. Preheat your wok or a large frying pan on low heat before adding oil. The heavier the frying pan the better, and if it's non-stick, you'll want to reduce slightly the amount of oil. Add oil, making sure the surface of the pan is well-coated. If using garlic, ginger, onions, or other whole spices, such as cumin seeds, add them and saute for 3 to 5 minutes, stirring constantly. 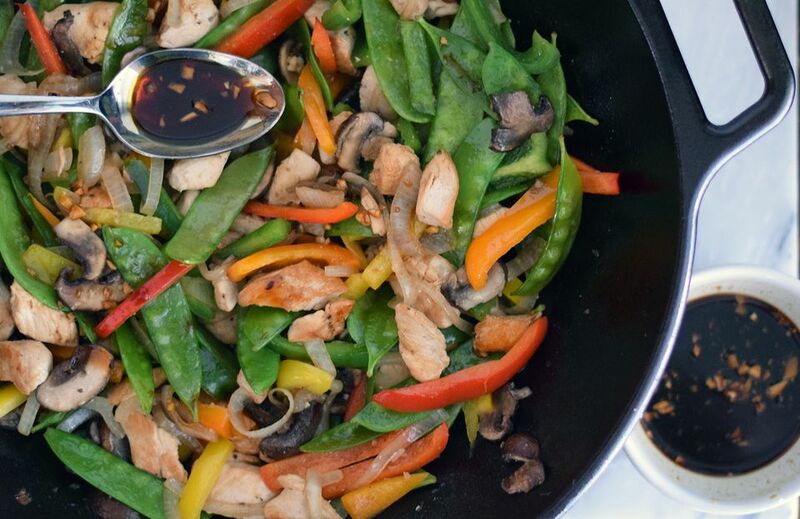 Determine which of your stir-fry ingredients need the most cooking time and add these first. For example, tofu, seitan, tempeh, and carrots need more time to cook than vegetables like mushrooms and bell peppers. Broccoli and green beans will get too soft if cooked too long. If you're using frozen vegetables, allow a little extra cooking time and be sure to account for excess liquid as the vegetables melt. Add the remainder of your ingredients and keep stirring. If you stop stirring, you run the risk of the dish being overcooked or burned. Add sauce or spices and stir until finished cooking. For a basic stir fry, you'll want about 3 tablespoons of sauce. Most of the liquid will cook off, leaving you with just the flavors. If you'll be serving the stir fry over rice or other grains, you'll want about 1/3 cup of sauce and may want to thicken it up with a bit of cornstarch or flour. Soy sauce, sesame oil, a bit of vinegar, or store-bought stir-fry sauces are easy to add to the dish and most stir-fry recipes will include a suggested mixture of liquid. If you don't really have a sauce planned, a bit of bottled soy sauce and some diced garlic or ginger will make a nice basic stir-fry sauce. If using a quick-cooking noodle, such as bean thread noodles, you don’t have to pre-cook them. Add the uncooked noodles and 1/4 cup water to the pot before vegetables are finished cooking. Cover and reduce heat, allowing noodles to steam cook for 5 to 7 minutes. If using rice, pre-cooked noodles, or other whole grains, add them to your stir fry just long enough to mix the flavors, about 3 minutes, or just keep your noodles, rice or grains warm while stir frying, and serve your stir-fried ingredients next to or on top of them. Plate your dish as soon as it's ready; stir fry is best served when it's piping hot.